Whitby Town are the visitors to Mariners Park on Saturday as league leaders South Shields look to continue their excellent form. The Mariners climbed to the top of the Evo-Stik Premier Division with a last-gasp winner against title rivals Farsley Celtic last Saturday. They are 20 points and 11 places above Saturday’s opponents, but joint manager Lee Picton has warned his players against complacency. Whitby have claimed a number of notable scalps this campaign – including a memorable victory over rivals Scarborough Athletic – and pushed Shields all the way in a narrow home defeat in November. Picton said: “We put in such a massive effort last Saturday and have put in such a massive effort on this unbeaten run that we’re on. “It would be absolutely criminal for us to take our foot off the gas in any way, shape or form at this point. “It goes back to the mentality in our dressing room. 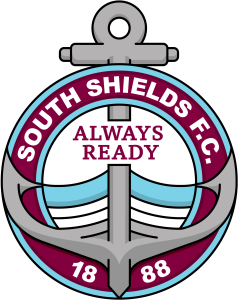 Shields have won all 12 of their home games in the league so far this season and are unbeaten in their last 13 league matches. Last weekend’s win over Farsley – sealed by a stoppage time Dillon Morse goal – was a particular high point, although Picton says there is room for improvement. He added: “The result against Farsley was a fantastic one, but we were nowhere near our best for long periods of the game. “We need to perform better tomorrow. The Mariners defeated Sunderland RCA 5-2 in the Durham Challenge Cup on Tuesday in what was their last outing. Picton had particular praise for the academy starlets which lined up for Shields. He said: “They all did extremely well and worked their socks off, which was so pleasing to see. “If the young lads really keep their feet on the floor and are prepared to work as hard as they have been and push themselves even further, they’ve got a great future in the game and they’ve got a great future at this football club. “We train on a perfect 4G pitch and we get to play on some good surfaces usually with the academy games, and Tuesday will have been a real test and eye-opener for them. “Hopefully they’ll play at a level where that will not be the norm, but that will have been a good learning ground for them. Shields go into Saturday’s 3pm kick-off without injured trio Carl Finnigan, Barrie Smith and Anthony Callaghan. Admission prices – which can be paid at the turnstiles – are £10 for adults, £8 for students and over-65s, and £3 for under-16s. Supporters can secure a discount of £1 on all tickets by ordering before midnight on Friday by clicking here.